The first Jester King beer to be brewed entirely in oak. Unfermented wort was racked directly to oak barrels and inoculated with souring bacteria. From there, it spent months aging in our barrel room before being blended with live kombucha at bottling. Unfiltered, unpasteurized & naturally carbonated through re-fermentation in the bottle. i thought this was awesome, but also expected the kombucha element to be way more intense. maybe a well aged bottle will show more of that, not sure how kombucha really evolves over time, but this is pretty mild. i have had some kombucha blended beers before and never been too moved by them, something about that vinegar profile in styles i am not used to it in, but here it makes perfect sense, and actually now think the jester king funk profile is pretty sympathetic to the natural acidity in some kombucha. also, they certainly picked some good stuff to blend with, its mellow to me in here, citrusy and flavorful and springy, but not a dominant force in flavor or feel, its definitely still beer first, and thats a great call to have made. pale yellow in the glass with a great head, on tap at the brewery, it probably doesnt get any better than it is right now. lemon flesh, farmy brett, and noble hops are here, its not overly complex for the kombucha, just seems like tart farmy session beer, almost akin to noble king, but with more of a citrus profile and a little less body and grain heft, siblings though, cousins at least. the flavors are awesome, wheat and clementine and meyer lemon and hay or straw, earthy and with an oncoming summer vibe. these guys make so many intense and distinct beers i kind of liked this one being a little more relaxed. i was worried the kombucha would be too much, but its not at all, i almost wish i tasted a little more tea here. looking forward to trying it from the bottle here soon! This one pours a light and slightly hazy orange color, with a fluffy head, and lots of lacing. On the nose I get funky wheat and citrus, with additional citrusy tea aromas that I assume come from the kombucha- it's kind of a peachy green tea aroma that I really dig. This is a really cool beer, and I don't even really like kombucha. The funky tea-like flavors are great, super citrusy, a bit herbal, and they meld well with the basic Jester King wild base underneath- wild hay and wheat flavors are the main things I get here. This is light bodied, crisp and very clean, with just a hint of lingering acidity on the finish. There's a soft level of carbonation, and a slightly creamy body. You can always count on Jester King delivering supremely unique beer that are definitively "them." 750 ml bottle into signature tulip glass; Batch #2, bottled on 8/23/2016. Pours slightly hazy/cloudy pale golden/straw color with a 1 finger dense white head with good retention, that reduces to a thin cap that lingers. Light spotty soapy lacing clings on the glass, with a fair amount of streaming carbonation retaining the cap. Aromas of big lightly tart lemon, lime, peach, pineapple, melon, green apple, pear, white grape, white wine, pepper, oak, hay, straw, herbal, grass, tea, wheat, and cracker; with lighter notes of leathery/musty funk, white vinegar, and yeast/oak earthiness. Damn nice aromas with great balance and complexity of fruity/funky/acidic yeast, tea, oak barrels, and moderate pale malt notes; with great strength. Taste of big lightly tart lemon, lime, peach, pineapple, melon, green apple, pear, white grape, white wine, pepper, oak, hay, straw, herbal, grass, tea, wheat, and cracker; with lighter notes of leathery/musty funk, white vinegar, and yeast/oak earthiness. Light lactic tartness and yeast/oak spiciness on the finish. Lingering notes of tart lemon, lime, peach, pineapple, melon, green apple, pear, white grape, white wine, pepper, oak, hay, straw, herbal, grass, tea, wheat, cracker, light funk/vinegar, and yeast/oak earthiness on the finish for a good bit. 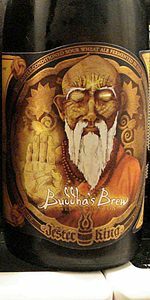 Great complexity, robustness, and balance of fruity/funky/acidic yeast, tea, oak barrels, and moderate pale malt flavors; with a great malt/tart/spiciness balance, and zero puckering/astringent flavors after the finish. Moderate dryness from tart/spiciness, increasing through the glass. Medium carbonation and light-medium body; with a very smooth, moderately crisp/grainy/acidic, and lightly tannic balanced mouthfeel that is great. Zero warming alcohol as expected of 4%. Overall this is an awesome sour/wild ale. All around great complexity, robustness, and balance of fruity/funky/acidic yeast, tea, oak barrels, and moderate pale malt flavors; very smooth, crisp, clean, and refreshing to drink with the mellow acidity/tartness. Classic Jester King house funk with nice kombucha tea balance. A really enjoyable offering. Unusual aroma with a funky component that's really separated from a pineapple-tropical fruit component. Moderately tart. Limited Brett and funk. High complexity.